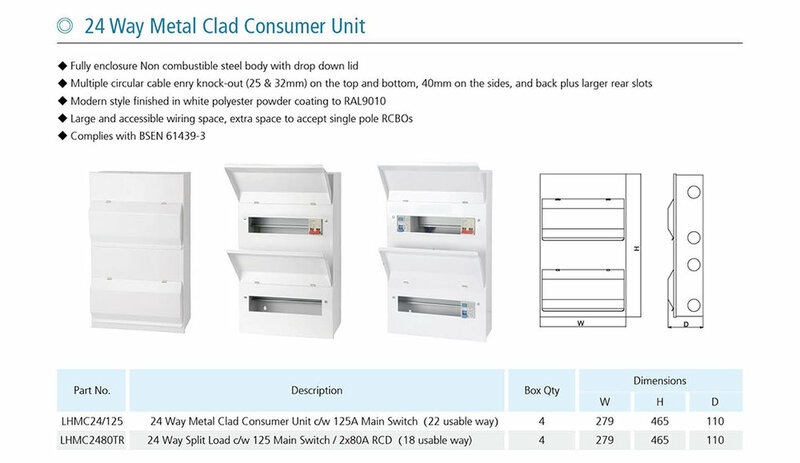 Our robust steel consumer units have a drop-down metal lid for safety and are all certified and approved BSEN61008, BSEN60898, BSEN61439-3. The operating voltage is 230/50Hz and protection degree IP40. They have multiple circular cable entry knock-outs on the top, bottom, sides and larger knock-outs on the rear. They have raised key-holes for secure and easy installation, and raised DIN rail for easy cable routing. Large and accessible wiring space includes extra space for RCBO's. They are stylishly finished in white polyester powder coating to RAL9010.